In the 21st Century, Spain have had a golden patch of form, winning back-to-back European Championships in 2008 and 2012 and a World Cup sandwiched between in 2010. They have also won two Mediterranean Games Trophies in 2005 and 2009 as well as the FIFA Team of the Year for six years spreading from 2008-2013. However in the last two major tounaments, Spain have been rather disappointing with Spanish greats such as Xavi, Xabi Alonso, Carlos Puyol, Andres Iniesta, Iker Casillias and David Villa all aging and/or retiring and with new talent not performing as well. After a shock knockout from the group stages of the 2014 World Cup after two defeats to Holland and Chile with the former putting 5 goals past La Furia Roja with doubles from Robin van Persie and Arjen Robben (as well as a header from Stephan de Vrij). The Euros in France were a chance for a rejuvinated squad to show their mettle and although Spain started well with two wins against the Czech Republic and Turkey, scoring four goals and conceding none, they sank to a 2-1 defeat to Croatia to send them to second place in the group. Subsequently Spain was forced into playing Italy in the Round of 16, which proved too difficult an opposition for the Spanish side which relied on the excellence of David de Gea to keep the score at 1-0 until the 91st minute when Graziano Pelle killed the game off. As the Spanish side travel to Russia, there have been controversial call-ups to the squad which have subsequently forced some players to be surprisingly left out of the squad. Alvaro Odriozola and Nacho Monreal are among the surprise call ups while Javi Martinez of Bayern Munich and Marcos Alonso of Chelsea have both been dropped despite impressive seasons. Lucas Vasquez is also a surprising call up who only scored eight goals this season in all competitons, which is less than Jose Callejon for Napoli or Bilbao's Inaki Williams who are significantly quicker wingers than Vasquez and could inject more pace into what is a pace-lacking Spanish side. Chelsea players have not had the best of luck for Spain with Marcos Alonso already mentioned, Pedro, Fabregas and Morata also miss out for Spain as well as Manchester United duo Juan Mata and Ander Herrera. 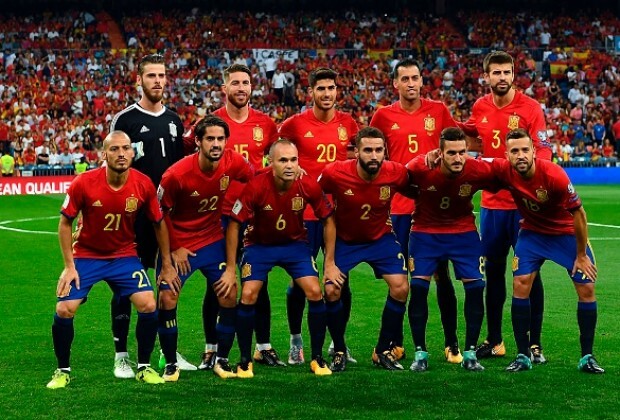 This squad has a lot of players who do not have much international experience with twelve players having less than 25 caps but have veterans amongst the youthful with Iniesta, Busquets, Ramos and David Silva all reaching over 100 caps for Spain (127, 103, 152 and 121 respectively) and will have to show all their experience if Spain are to do better in this year's World Cup. David de Gea has managed to gradually edge his way into the Spanish squad after Iker Casillias' atrocious performances at the 2014 World Cup. He has been United's true no.1 goalkeeper for six years now and has been stunning for United saving them countless times and never more than at the Emirates last December, making 14 saves to deny the Gunners and maintain United's lead for the whole game which ended 1-3. He also denied Liverpool a victory at Anfield even earlie in the season with a spectacular save with his foot to deny Joel Matip, which won Match of the Day's Save of the Season (his fifth in six years). The list goes on with saves denying headers from Benteke and Aguero which eventually earned United 2-3 victories away from home. He can easily be quiet and unchallenged for 80 minutes and then make a world class save to keep his side in the game. A vital asset for club and country and will hope to win his first senior international trophy. These two may be enemies in La Liga but will work together in Russia and aim to keep out the likes of Ronaldo, Gelson Martins or Bernardo Silva in their opening game against the European Champions. They will have to work hard and inspire confidence in the rest of the team and turn defence into attack. These players have all won silverware this season and are mercurial talents. Silva played a vital role alongside Kevin de Bruyne in City's title winning season, whilst Isco often held the get out of jail cards in the league when Real's luck was down. Thiago has admittedly had less of an impact this season but was vital in last season's title and Champions League campaign and over the last two years has got an average rating of 7.70 from WhoScored.com. They will all fight for places against Atletico's Saul Niguez and Koke who have had equally good seasons as well as Barca's Sergio Busquets and vice-captain Andres Iniesta but should be vital if Spain do progress far in the World Cup as they ought to do. If Spain beat Portugal in their opening game, they should cruise through the remainder of the group and should earn themselves heavy victories against Morocco and IR of Iran. With this prediction they are likely to then face either Egypt or Russia in the Round of 16 and should beat either side. Spain should then play Argentina in the Quarter Finals and it is genuinely a cointoss as to which side will come on top, it will probably end with an extra-time winner or even penalties. If Spain manage to overcome Argentina they would face either Germany, England or Colombia and should beat England or Colombia but may struggle against the Germans and only time will tell to see if Spain can replicate the glory eight years ago.